How might we use technology, new business models and design to guarantee healthy, safe and sufficient food for everyone? Home / Blog / How might we use technology, new business models and design to guarantee healthy, safe and sufficient food for everyone? Every calorie counts: Reducing food waste should be the first priority in ensuring a sustainable food supply chain. New technology is transforming how we look at waste. At Winnow we believe that food is too valuable to be wasted, and that technology can transform the way we prepare it. By tackling food waste aggressively and strategically, we all stand to gain from a more efficient, robust food supply chain. Every day, the world wastes roughly 1/3 of all food that is grown at some point between farm and fork. This is equal to over $1 trillion in waste or over 1% of global output. When the world ponders how to feed the growing population over the next 30 years, reducing this waste is first place we should start. Only in the past 10 years have we really begun to understand the scale of this issue. Now that we appreciate the level of waste that exists in our system, it’s time for us to move from talking about why it’s a problem to finding solutions to address it. The good news is that reducing waste is largely a win-win for everyone in the supply chain. At each point, there is an opportunity to either be more efficient for find new outlets for food that would otherwise go uneaten. Food distributers improve their forecasting and buying techniques or gain tax breaks by donating food to those in need. Restaurants produce the right food and put the right product in front of their customers. Consumers get smarter about what they buy and how much they make. In all instances, we save money while decreasing the needs for more intensive farming as food demands continue to increase with growing populations. We are at the nascent stages of innovation when it comes to reducing food waste, particularly with technology. There are only a handful of companies trying to solve this problem and yet the size of the opportunity is enormous. This is bound to change. Big Data: What you measure gets managed. Today, there is only sparse data on what is wasted. Accurately recording what is waste and why and then using that data to drive insights on how you can change operational practices and people’s behaviour has tremendous power. Once you know where waste is occurring, improved forecasting and production planning allows you address the issue at its root cause. New Markets: We clearly know in advance when something is likely to be wasted. Identifying companies or people who will buy that product and make use of it prior to its expiry is a brand new revenue stream. Today, there are companies doing this at the farm level (Food Cowboys) and at homes (Olio). Extending expiry dates: A myriad of new solutions are looking at how we can extend the shelf life of produce and other foods to make sure they can last until they are eaten. This can be particularly helpful in supermarkets and homes where the leading cause of waste. At Winnow, we focus on the first area of Big Data. We’ve found that kitchens simply don’t know how much is being wasted, and that many large kitchens waste 20% of the food they buy. This is not through incompetence, but because they lack the correct tools. 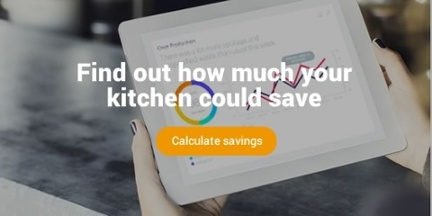 By monitoring waste with our technology, we help chefs improve their kitchen practices and drive significant savings to the bottom line. We are on a mission to solve the problem for restaurants on a global scale. We’re already live in 6 countries and are savings our clients millions. However, we’re only scratching the service. Really solving this problem means we need to be saving our clients billions. When we reach that goal, we’ll have an exciting business at the same time. There are so many opportunities to fight waste in the food supply chain and tremendous wealth and impact that can be generated by doing so. Our real question is: Who’s going to join us in the fight?